Our shadow program is perfect for the established professional dog trainer looking to hone in on their skills or the beginner looking to start a career in the world of dog behavior. This intimate program involves following Colleen (very closely) throughout her day of client consultations, rehabilitation work with aggressive and fearful dogs and pack work. But don’t plan on just being her shadow! This is a hands on program, so prepare yourself to be part of the pack! Colleen will also tailor challenges specifically for your level. These are full days, generally 9am-5pm. Please contact us with the dates you would like to book. Learn the fundamentals of the Dogtra Remote training collar or Ecollar as a tool for communication. 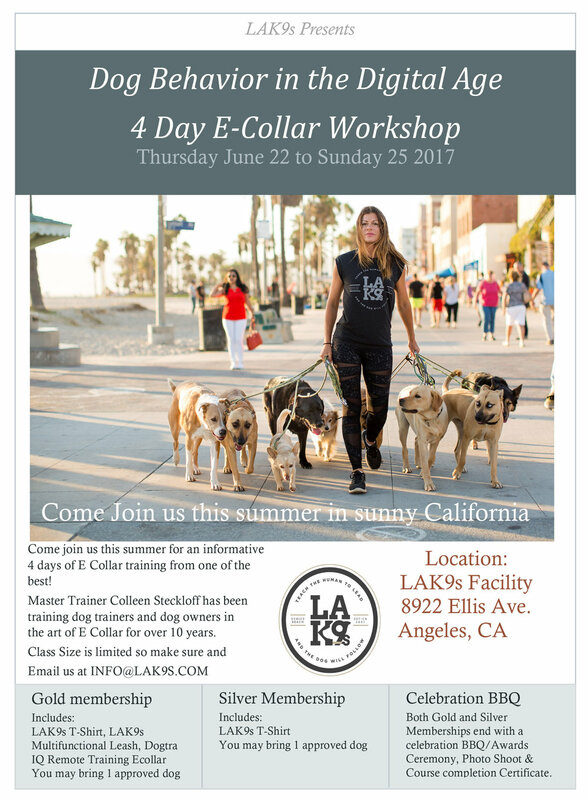 Former students are professional dog trainers, rescue volunteers, shelter workers, dog walkers and dog owners looking to learn how to use and teach the remote training collar as guidance and motivation, not just for correction. Space is limited for this workshop, as we keep the class very small to maintain individual attention. You may bring a dog to work with, but we will also provide you with many different dogs and behaviors during the course. You will learn how to train your dog owners on how to use the Ecollar correctly so it becomes a tool they trust and use with confidence. Along with student dogs, you will teach rescue dogs the fundamentals of dog behavior. This is a 4 day course with full 8 hour days. Tuition includes one Dogtra Ecollar. Snacks and drinks will be provided throughout the day and the course ends with a graduation dinner to celebrate. Please contact us for available workshop dates.